Greenhill is an extended crofters house, set in its own grounds with access across the croft to the sea. It has been owned by the same family for 4 generations and is traditionally and comfortably furnished. If you’re looking for a wonderful family house to rent in Achiltibuie you have come to the right place. Greenhill is a converted and extended crofters cottage which is set in its own grounds and has wonderful views across the croft to the sea and Summer Isles. The traditionally furnished house sleeps up to 6 people and is the perfect base from which to walk, fish or just explore the amazing local beaches and scenery. Pictures of all the rooms and details of how to book can be found HERE. Today we have opened bookings for self-catering holidays in 2014. Greenhill was one of the original crofting houses in the village that was extended into a comfortable family home nearly 100 years ago. The house is set in its own grounds and an incredible base from which to explore the NW Highlands or simply to sit and soak up the spectacular views over the sea towards the Summer Isles. Greenhill is comfortably and traditionally furnished and comfortably sleeps between 2-6 people. There is a sitting room with an open fire, four bedrooms, a bathroom with the original Victorian bath and shower, a dining room, kitchen and utility. We’re getting a lot of enquiries about renting Greenhill for self-catering in 2013. Greenhill is a comfortable family home that has been owned by the same family for generations. It is traditionally furnished with an open fire and 4 cosy bedrooms. It sleeps 6 and is set in wonderful, secluded grounds with amazing views over the Summer Isles. There is direct access across the croft to the sea. Greenhill makes an ideal base for a family holiday or for a couple who want a bit of space and room to relax. Around this time of year we always see a huge number of enquiries from families looking to rent our house in Achiltibuie. Maybe there is something psychological about the start of a new year or maybe you are just a blank new diary and starting to plan how to fill it… whatever the reason I recommend that you make time for a visit to Achiltibuie in 2012. Greenhill is a comfortable family house that sleeps up to 6. It is available for self catering holidays throughout the year. The summer months and school holidays always book up very fast but whatever time of year you fancy there is always lots to do in Achiltibuie and the surrounding area. Pictures of the house and rooms can be seen here together with rates for booking the house. We have today opened up bookings for Greenhill in 2012. If you would like to book the house for a self-catering holiday please do get in touch. The peak summer weeks, Easter, May and Spring Bank holidays are always extremely popular so we would advise you to plan in advance if you want to stay at the house. I was having a look at YouTube the other day and came across a great 360 degree video from Tanera (one of the Summer Isles) looking back towards Achiltibuie. You can really see how the weather changes in the area & the fantastic landscape. A great event in Achiltibuie tomorrow – the annual Coigach Gathering which starts at 12.30 with the piping of Cheiftain Dorothy Miller on to Badentarbet Green. 1.30 Piping & fiddle competitions. 2.00 Hill race – juniors, ladies, men’s & seniors. Lots of stalls, games and food. Get along there and enjoy the day – it’s all free to attend. Hope the weather is fine. With all the bank holidays coming up – Easter, May Day, Royal weddings etc. – we’re getting loads of enquiries about renting Greenhill for holidays. Currently there is availability for many of the weeks. I don’t keep an up to date booking form on this site but if you are interested in a holiday in Achiltibuie before summer then please do drop me a note. Greenhilll is an old crofters house that was extended in the 1920’s. It sleeps from 2-6 people and has amazing views over the Summer Isles. It provides a fantastic base for holidaymarkers to explore the NorthWest Highlands of Scotland. Disappointing news today that The Summer Isles hotel in Achiltibuie has lost its Michelin star (http://reut.rs/hW2dFk). The Summer Isles hotel is one of the main draws for high-end tourists to the region and generates a huge amount of publicity for the area. Wherever I go I meet people who have heard of it and have often come to Achiltibuie as a direct result. I hope this doesn’t affect the number of holiday-makers visiting. It is interesting that the hotel changed hands recently. Indeed I wrote recently about some teething problems that the new owners were having. I am sure that if they continue to hold on to talented head chef Chris Firth-Bernard that this will only be a temporary blip and the star will be regained shortly. Good luck to the team there (who dropped me a very nice note after my last post). We always find that the first weeks of January are the peak time for enquiries about our house in Achiltibuie. Maybe everyone is opening their new diaries and planning holidays. Alternatively, the whole country may just be fed up with the problems that air travellers had in 2010 and are looking for somewhere closer to home? Whatever your motivation I’d really recommend that you consider a holiday in the highlands of Scotland this year. The most glorious unspoilt beaches – our favourites are Achnahaird and Achmelvich but there are many smaller and less well known ones along the coast – great for picnics with the kids. Amazing scenery and wildlife. Whether you like walking, bird watching or just soaking up the big country and views out to sea with a good book; the highlands can not be beaten. Foodie heaven. Fancy your langoustines fresh off the boat? How about the freshest fish supper from an Ullapool chippy? Maybe some Michelin-starred dining? This part of Wester Ross has got the lot. Outdoor activities. If you prefer your holidays to have a theme then why not try some sea kayaking around the Summer Isles as part of your holiday. We tried it this year and loved it. Whether your planning a holiday for the family or a get away from it all break with friends, Greenhill is an ideal base to explore the region. 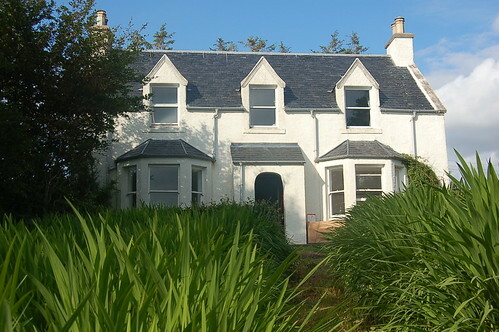 It’s an old crofting house with magnificent sea views & set in its own grounds. The busy summer months & school holidays are already booking up but there’s plenty of time to think about holidays at Easter, May Day or Spring Bank Holiday. Visit these pages to see some photographs of the house and to enquire about renting. Come to Achiltibuie in 2011 – we guarantee you a memorable holiday. Happy 2011. Chris Firth-Bernard of the Summer Isles hotel in Achiltibuie prepares some of his favourite dishes on this programme for STV. Ever since Hollywood came to Achiltibuie last year there has been great anticipation of the launch of The Eagle of the Ninth film. The release date has been put back a couple of times but an official trailer has now been released under the revised name of “The Eagle”. There are some great shots of horse riding across Achnahaird beach and also from the hill at Fox Point with views across the Summer Isles. I’m really looking forward to seeing it. If you are currently planning your holidays for 2011 then I really recommend you consider the NW Highlands of Scotland. We have just started taking bookings for next year at Greenhill – a comfortable family house by the sea that is available for self catering all year round. Some of the summer weeks have already been reserved but there is still plenty of availability for Easter, Spring Bank Holiday, Mayday (or even to be as far away from a Royal Wedding as possible!). or, anyone who loves to get away from it all with a good book, spectacular views and an open fire. The house is a converted and extended old crofters’ cottage, set in its own grounds that sleeps between 2 and 6 people. Pictures of all the rooms, rates for rental and booking details are available on these pages. Last October there was great excitement in the village when Hollywood descended to film The Eagle of the Ninth. The film has yet to see the light of day but I believe is due for release in early 2011. 12 months on and it’s production time again. Not quite so Hollywood but looks interesting nonetheless. In the 3rd week of October “An Incident in Time” will be shot over 4 days in the area. The film is described as “an ambitious, bold and darkly comic short film following a band of Pictish warriors as they trudge across the wind blasted landscape beneath the crown of Stac Pollaidh”. The producers are looking to cast a small number of locals as extras in the film and are also looking for runners. Contact Tom Duncan for further details. Late Summer / Autumn holidays in Achiltibuie? The family are just back from a great late-Summer holiday at Greenhill. All in all it was a fantastic holiday. Greenhill has been booked fairly solidly since Easter but we now have a few weeks free for late summer/early autumn holidays in Achiltibuie. If you are interested in any of the following weeks: 4th September; 25th September; 2nd October; 9th October; 16th October; 23rd October or 30th October please look at these pages for further information and get in touch. A quick note to say that we had a cancellation for Greenhill today for 2 prime weeks in the summer holidays – starting 7th & 14th August. If you’re interested in a holiday in Achiltibuie please let me know as soon as possible because these weeks are always very popular. Greenhill, Achiltibuie, originally uploaded by Rory Brown. Once again this year it seems as though many families are choosing to stay in the U.K. for their holidays. Uncertainty over flights following the Icelandic ash cloud, combined with the weak pound has meant that holidays in Scotland have never been more attractive. Maybe you have been inspired by Monty Halls’ new Great Escapes programme, want to spend time on some glorious empty beaches or experience the delights of the Caledonian Sleeper instead of flying? Whatever your motivation I recommend a holiday in the NW Highlands.